Sheep sale Monday, April 8, 2019 - Store lambs sold from €35 to €68 over. Factory lambs sold from €60 to €82 over. Butcher lambs sold from €65 to €89 over. Fat ewes sold from €70 to €148 each. Ewes with 1 lambs sold from €130 to €192. Ewes with 2 lambs sold from €170 to €320. A bigger entry of sheep at Raphoe Mart on Monday, April 8th April. Trade was improved on last week with factory agents keen to purchase fat sheep. Fat hoggets sold regularly up to €134/head. Ewes and lambs sold well with farmers bidding well and weather outside looking good. Ewes with two lambs at foot sold up to €320 while ewes with one lamb sold up to €192. Easter lamb sale, sponsored by Kiernan Milling, will take place next Monday (April 15) at 11am with spring lambs being sold first, a prize draw will take place for all entrants of spring lambs on the day for meal vouchers. No sale on Easter Monday (April 22). Cattle sale Thursday, April 11, 2019 - Bulls sold from €2.00/kg to €3.00/kg. Heifers sold from €2.10/kg to €2.90/kg. Beef bullocks - €660 to €900 over. Store bullocks - €400 to €865 over. Beef heifers - €600 to €865 over. Store heifers - €350 to €635 over. Dry cows - €600 to €1,710 each. An extra large sale at Raphoe Mart on Thursday, April 11. Great weather and grass brought out cattle and buyers as well. 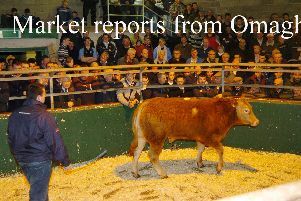 Quality cattle sold to top prices and were in great demand. Plainer lots also sold well with HEX and AAX selling to €2.00/kg. Friesian cattle remain most difficult to sell. Please note: *Sale cancelled* Due to lack of interest the sale of pedigree beef females which was due to be held in Raphoe Mart on Friday, April 26, 2019 has been cancelled. For sale in Raphoe Mart on Thursday, April 18, 2019 - 12 four and five star heifers, Simmental and Simmental cross Limousin, one year old approximately. Please note: There will be no sheep sale on Easter Monday, April 22, 2019.